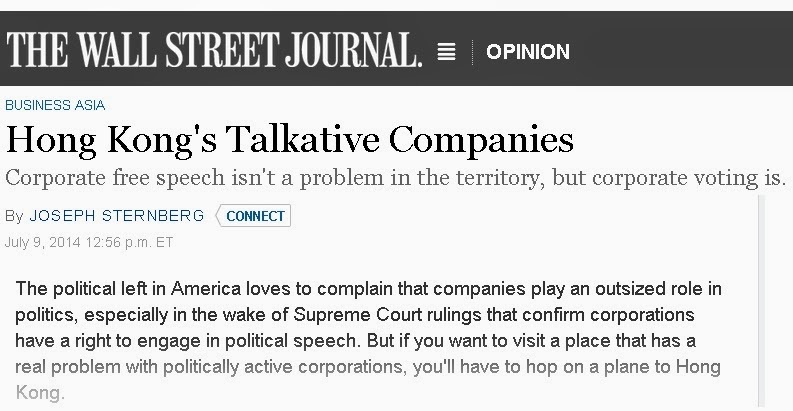 This is my article today in thelobbyist.biz. Last Monday, before President Aquino delivered his State of the Nation Address (SONA) 2014, I noted that facebook was peppered with so many anti-government, anti-PNoy posts and complaints. Was it good? Maybe yes, maybe no. But one thing is sure: Government is force and coercion. No matter how much we complain about the government or a particular administration, we are forced, coerced and arm-twisted to contribute to its annual funding via taxes, fees, fines and mandatory social contributions. Next time, people should NOT support new programs that expand government. Like new tax hikes unless a tax cut somewhere else is made. Like a new subsidy and welfare program unless some existing subsidy programs that do not work are shrank or abolished. Or creating a new agency or bureaucracy unless an existing agency or bureaucracy is drastically shrank or abolished. Government has three levels -- local, national and multilaterals (UN, WB, IMF, ADB, etc.). All of them share the same characteristics. Generally wasteful, tax-hungry and always saying that "things are bad, we need more taxes and subsidies to solve them." They said that 3 or 5 or more decades ago, they say it today, they will say it 2, 4 or more decades tomorrow. There is also an observation that Filipinos are “puro angal pero walang aksyon” (all complaints, no action). Right. We should have less government responsibility, more personal and civil society responsibility. Yan ang tunay na "aksyon". But for many activists and "reform-oriented" groups, they want "more/bigger but good government". I think they are setting the public for more deception and disappointment. When government expands, at least 50-60 percent of the total budget and funding goes to salaries alone. Plus offices and office supplies, electricity and gadgets, vehicles and fuel, travels and trainings, etc. Very little can be expected to go to the supposed beneficiaries, like actual roads. And we are not talking about corruption and robbery yet. People who are advocating similar campaigns are selling an idea, not individuals or politicians. The idea of less government, more personal and civil society responsibility. If many people will buy that idea, the supply of politicians who will articulate that idea will come in. I doubt though that many people want more personal responsibility. Gusto ng mga tao, painom-inom, pa tambay-tambay, at hingi lahat sa gobyerno. Pag di nabigay or kulang binigay, magagalit, susuporta sa oposisyon, at uulitin panghihingi. Many civil society leaders also support this mentality. That is why they keep lobbying for "more but good government". More government, we got it. Good government, I don't know. When Marcos was kicked out in 1986, or even in several administrations before Marcos was elected in 1965, "good government" has been the battlecry of almost all groups and political parties. Meanwhile, this news report, PARA DI NA MAULIT DAP | Speaker seeks creation of oversight committee to examine govt spending, referring to House Speaker Sonny Belmonte is “naku naman.” The whole legislature is created by the Constitution mainly to be the oversight body of the Executive branch. Each Committee and special Committee is supposed to perform oversight function over each Department and bureau in the Executive. To create a separate committee means the other Committees will not do their oversight function seriously? two ideas i wish to share ... first, the inherent powers of the State. With or without legislation, these powers are a given to any State otherwise, it will not function as such. In political theory, they are 3: taxation, police power and eminent domain. Second. In parliamentary systems, the Cabinet is made up of legislators (MPs or Member of Parliament) belonging to one party, the ruling party) The legislative and the executive are merged. In presidential forms, they are separate. Tripartite, which includes the judiciary. Oversight committees are de riguer in presidential forms. In parliamentary forms, government is dissolved and a new one elected. No need for oversight. Bright contribution, I thanked Rey for it. 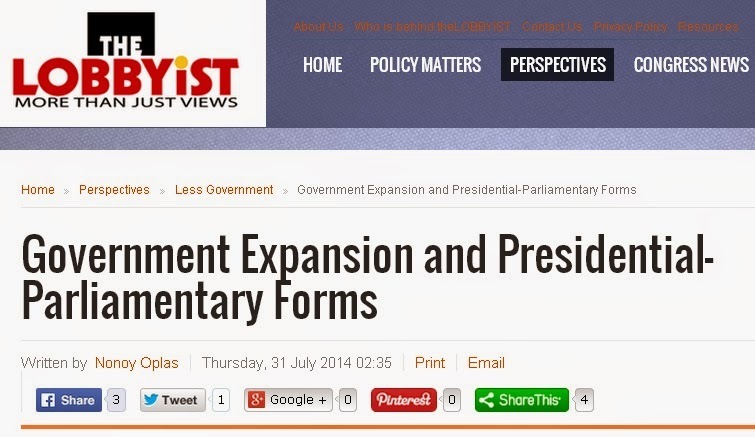 And I agree, that is why parliamentary governments tend to expand much faster than those in presidential form. The Prime Minister can talk and debate with himself and along with key leaders of the parliament, they can discuss and quickly implement projects, which almost always are about new and expanded welfare/subsidies, and high taxes and huge borrowings to finance these endless subsidies. A really independent Legislative in a Presidential form should result in frequent gridlock between the Legislative and Executive, and this results in slow expansion of government. o minimize or even prevent such gridlock, pork barrel -- hard or soft, explicit or implicit -- is invented by the Executive, essentially a bribe to the Legislature to prevent gridlock and tolerate the wastes and fiscal irresponsibility of the Executive. In theory, parliamentary forms work well with strong political parties which unfortunately we do not have. Parties with strong ideological underpinnings. We imported American democratic institutions hook line and sinker without the necessary basic fundamentals of party politics. The 1987 Constitution further bastardized the presidential form with the introduction of the European party list again without the basic fundamentals in place. Sad but true. That is the story of our politics in the Philippines over the past decades. Ever wonder why some are advocating for a constitutional convention to change the charter. Personally, I like the two-party system in the Philippines before, after the adoption of the US-style constitution. The Nacionalista Party means nationalists-protectionists while the Liberal Party means globalists-free traders. Similar to the Democrat-Republican rivalry in the US. Thus, it was an ideology-based political system in the Philippines then, although many Liberals were as populists as the Nacionalistas in getting voters’ support. I remain agnostic on the Presidential vs. Parliamentary debate. I am only interested in small and limited government, whether it is a Presidential or Parliamentary form. Below are notes by a physician friend, Doc Erwin Abueva, in his facebook wall, February-March this year. Real stories from physicians in emergency room (ER), wards, operating rooms. Some stories are funny, some are sad. Somehow they provide additional dimensions in the continuing discussions about universal health care (UHC). Thanks a lot for sharing these stories Doc. Non-physicians like me find them informative. 11 stories, 2,000+ words, more than 4 pages long. Enjoy. Meanwhile the photos, I got from the web and just added them here. Two male dialysis patients, both in their late 50's, were talking to each other. One patient is having his dialysis for 3 years already in the said hospital, while the other is a "first-timer", had his dialysis sessions in a hospital in Bulacan for 2 years. PATIENT 1: Bago ka po dito, no? Ngayon lang kita nakita dito. (smiling). PATIENT 2: Opo. Sa Bulacan po ako dati nagdadialysis. Lumipat na ako dito kasi sa anak kong panganay na ako nakatira. Sa kanila na lang daw kami ng asawa ko. P2: Hindi po. Naibenta ko na kasi yun bahay namin sa Bulacan dahil sa pagdadialysis. Ang hirap ng sakit natin, ubos ang pera. Ang mga naipundar kong konti unti-unting nawala na. P1: Talagang mahirap. Mabuti na lang medyo marami pa ako savings. P2: Buti pa po kayo. Maraming panggastos. Swerte nyo po. P1: Ikaw ang swerte. Kasi ikaw kahit wala ka nang pera, nariyan ang anak mo nakasuporta. Ang asawa mo kasama mo ngayon, hindi ka pinapabayaan. Ako, iniwan na ako ng asawa ko last year. Pumunta na sa Amerika. Napagod na yata sa pag-aasikaso sa akin. Ang mga anak ko parehong nasa abroad. Ni tawagan ako hindi nila magawa. driver ko lang kasama ko lagi dito sa dialysis. P2: Opo, kasama ko pamilya ko. Pero wala naman akong pangsustento sa dialysis ko. Hindi din ganon kaswerte. A 64 y.o. Male came in due to nose bleeding. With him was his wife and his daughter. DOCTOR: Ano pong nangyari sa inyo sir? Bakit dumugo ang ilong nyo? PATIENT: Napasubasob ako sa sahig. Mukha ko tumama diretso sa sahig. DOCTOR: Paano pong napasubasob? Nadapa po kayo o natisod ba? Buti di kayo nawalan ng malay o napasama ang dapa. PATIENT: Hindi naman ako natisod o nadapa doc. Napasubasob lang basta. WIFE: Naku doc, ganito kasi yan. Pagkabangon nya sa kama, lumuhod daw sya para magdasal. Tapos bigla na lang natumba sa pagkakaluhod at tumama yun mukha sa sahig. DOCTOR: Ibig sabihin nakatulog kayo habang nagdadasal kaya napasubasob kayo? PATIENT: parang ganun nga yata nangyari sa akin. DAUGHTER: Hay naku. Tatay, next time kasi huwag na kayo lumuhod pag magdadasal kayo. Pwede naman nakahiga kung magdadasal. WIFE: At huwag mong masyadong habaan ang dasal mo para di ka antukin. A 24 y.o. Female patient came and directly went to the Doctor's Table. PATIENT: Sino doctor? I need to see a doctor. DOCTOR: Yes ma'am. I'm the doctor here. DOCTOR: Sige po ma'am. Take a seat. Ano ba ikoconsult mo at napasugod ka sa ER ng 3AM na? PATIENT: kasi eto o. An-an ba ito doc nasa leeg ko? Di kasi ako sure. An 11 y.o. female patient was brought by relatives due to asthma attack. He was exposed from dust while her mother was cleaning their cabinet. DOCTOR: (to the mother) paiinjectan po natin ng antihistamine sa arm nya. And magbibigay din ng steroid thru IV. Sa ugat po papadaainin yun gamot. Magnebulize din po ang bata ngayon. MOMMY: Sige doc kung yun ang dapat. Ok lang po. FATHER: Ikaw magtutusok (looking at the nurse)? Galingan mo sa pagtusok. Pag pumalya yan, makikita mo. NURSE: Sir, itatry po namin na 1 shot lang. Unfortunately, the nurse missed his first try. LOLO: Tsk tsk. Wala bang sharp shooter dito? Hindi ka naman pala marunong e. Yun sigurado. Yun magaling. DOCTOR: Pasensya na po pero minsan mahirap maginsert. I understand ayaw nyo masaktan ang anak nyo. Ang mga nurses po dito experienced na maglagay ng swero. Pero wala pong hindi nagkakamali. Another nurse tried inserting heplock but was also failed. DOCTOR: Sir, kung 100% sure ang hanap nyo, hindi ko din magaguarantee yan. Sa totoo lang, mas experienced pa ang ER nurses namin sa paglagay ng swero kesa sa akin. Pwede po bang kami na lang muna at si mommy nalang dito? MOTHER: Oo nga. Umalis na muna kayo Tatay (lolo). Doon muna kayo sa labas. After the two men went out, the same nurse was able to insert "heplock" to the patient's hand, fortunately with 1 try only. Swabeng tusok, walang pressure. MOTHER: Kanina pa dapat kung hindi kayo mga masusungit sa nurse. Several minutes ago, a 65 y.o. male was rushed to the ER due to loss of consciousness. 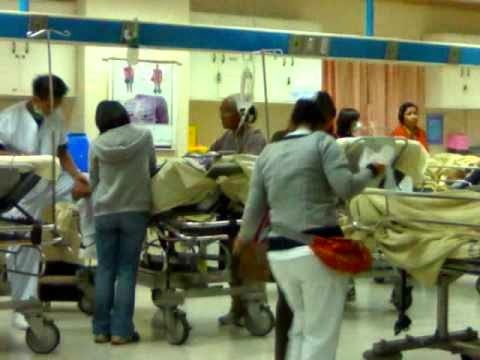 The patient was with his wife strolling at SM Marikina when he suddenly fell on the floor unconscious. The patient had 3 previous heart attacks and underwent open heart surgery few years ago. The patient did not respond to CPR done, to all medications given. He was pronounced dead 40 minutes after. Sad events like this makes me realize of my mortality. Few minutes ago nag-uusap lang sila and nagtatawanan. In a matter of seconds, nawala na ang isa, permanently! These are my notes about the Disbursement Acceleration Program (DAP) last week, posted in my fb wall. DAP is wrong. Not for constitutional issues (I leave that to my lawyer friends) but for fiscal and economic issues. Those "idle" funds were not there in the first place; they were borrowed money. If DAP is P100 B and government borrows P300 B a year, then if DBM/Malacanang left those "idle" funds unused and unspent, then govt borrowing should be only P200 B or less. DBM Sec. 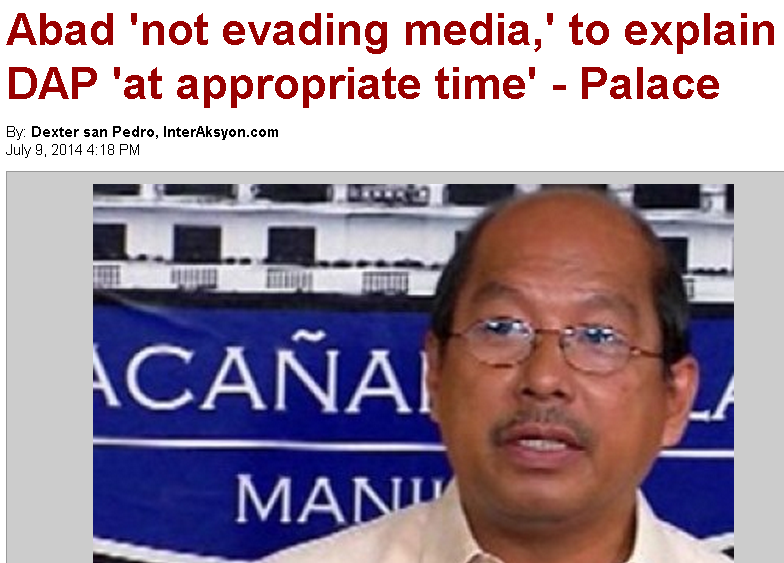 Abad said at the Senate hearing last week that "DAP is made on the principle, 'use it or lose it.'" DBM and Malacanang used it. Wrong. They should have "lost" it, by not spending it; in the process, remove the need for borrowing the same amount. Sorry Sec. Butch but your arguments are faulty. If you "use" it for bleeding heart programs like giving free medicines to the sick and dying, drainage and bridges against flooding, then cutting borrowings, reducing the public debt stock and sparing the pockets of future taxpayers, and reducing current annual interest payment of about P330 B a year, is an even better bleeding heart goal. 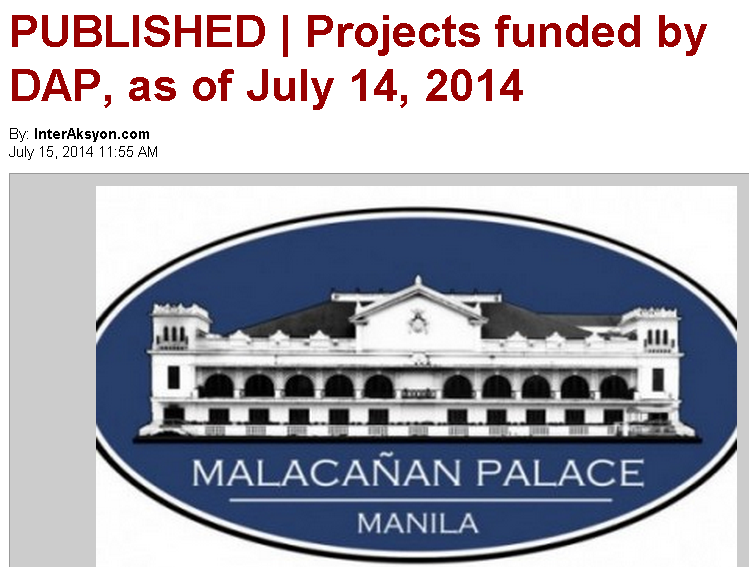 Even if 100 percent of the programs funded by DAP are good, not a single centavo of it was stolen, it is still wrong. All the good and excellent programs that DAP funded could be funded by the regular budget, unless DBM will call the latter as “not good”. To cut borrowings is an even better, more bleeding heart goal, than continued fiscal irresponsibility. Of living beyond one's means. Of endless borrowings, with or without a crisis. I argued in the past that the Freedom from Debt Coalition (FDC) is wrong in their campaigns. We can never have freedom from debt unless we have freedom from borrowings mentality and policy. Never. Government should stop borrowings whenever possible. If projected revenue is P2 trillion, then spending should be P2 trillion and not P2.3 trillion because government will borrow P300 B. Better yet, spend only P1.8 trillion, use the P200 B surplus to pay back the debt. In times of crisis, borrow. In times of no crisis, pay. The public debt can never be repaid by taxes alone. It is P5.6 trillion now. It is rising by around P350 B a year, with or without a crisis. The debt can be paid or at least drastically shrank by large-scale privatization + pay back via fiscal surplus. The P330 B a year interest payment alone is already huge and scandalous. Fiscal irresponsibility works this way: All administrations say, "We are paying for debts and loans enjoyed by our predecessors. Might as well do it too. Spend-spend-spend now, let the future administrations and taxpayers worry where to get the money." Pag sa households and micro level yan, someone who earns P50,000 a month and spends P55,000 a month, consistently, ang tawag dyan "gastador" or "maluho/magarbo”, “mayabang/hambugero", "iresponsable", "living beyond his means", etc. Pero pag gobyerno ang utang ng utang, "ok lang yan; it's for good projects naman eh" or "it's to fight poverty naman eh". People can demonize personal irresponsibility but not fiscal/government irresponsibility. Also in the households, do not incur new spending if your resources are tied to old or recurring spending. Thus, do not buy a 2nd car yet if the 1st car can still service various household needs. This is not the case in government. They create new welfare program/s and subsidy/spending even if some old and existing welfare programs do not work as designed. Like the CCT, a huge multi-billion pesos subsidy program for the poor, without shrinking or terminating some existing subsidy programs that do not work. Basta lang gastos ng gastos, utang ng utang. "Incurring debt is necessary to expand economic activity" is true if done on limited period. If done endlessly, wrong. In periods of no crisis, we should aspire not only for balanced budget, but budget surplus, pay some debt. In periods of crisis or emergencies (like the big earthquake of 1990, the Pinatubo eruption in 1991), borrow. Again, people can demonize personal irresponsibility but not fiscal/government irresponsibility. The DAP controversy has also showed that political patronage has expanded from the traditional local and national politicians, to some NGOs and people's orgs (POs). Not the Napoles-type NGOs but old, grassroots, well-meaning NGOs. DAP has funded party or entirely, their programs for fisherfolks, poor patients, urban poor, indigenous people, women workers, the oldies, etc. Thus, DAP is good even if it may be unconstitutional or has violated existing laws and RAs. So long as it is our sector and NGOs that benefited, it is good. Notice also that almost all governments around the world are fiscally irresponsible. Heavy and endless borrowing is in their DNA. Wastes and irresponsibility seems to be "built in" their system. Every year is a "crisis" or "emergency" year and thus, over-spending via borrowings is the default mode. The "idle" funds used for DAP presented a good opportunity for the President to think and act Liberal -- Liberate the taxpayers from endless burden of heavy and multiple taxation to finance government wastes and huge debt stock. But the President acted like any populist leaders where "each year is crisis year" with zero exception. 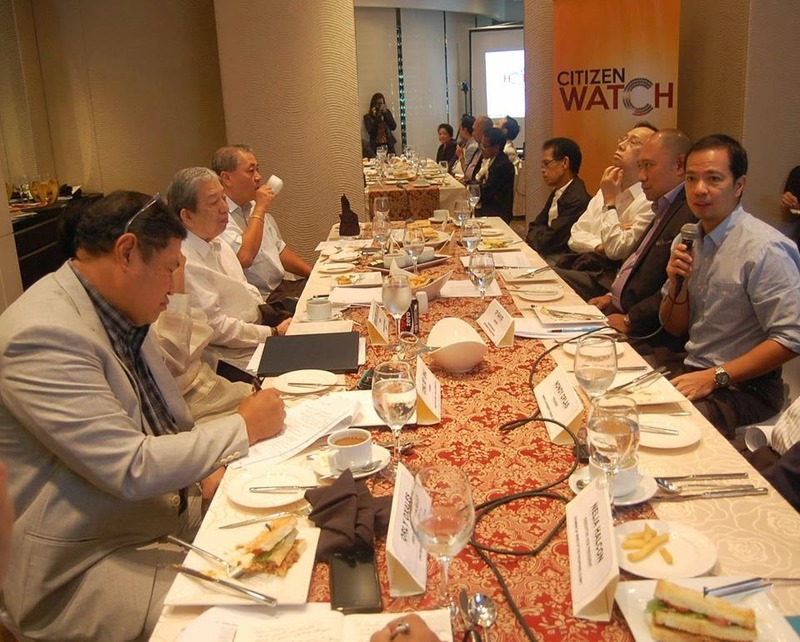 Last Wednesday, I attended a Citizen Watch round table discussion on "An Economic Reform Agenda for ASEAN Competitiveness" organized by the Stratbase Research Institute (SRI), a Makati-based think tank. 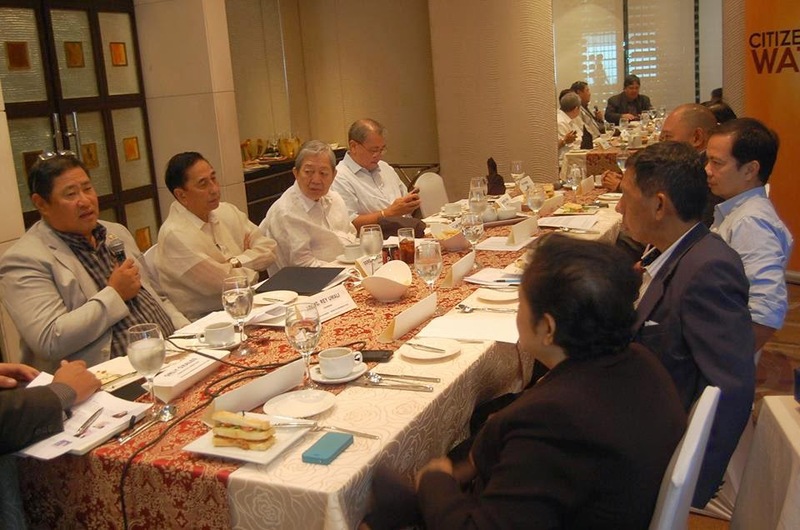 It was held at the Tower Club, 33rd floor of Philam Life building. I think it was my first time to see that place. Nice. 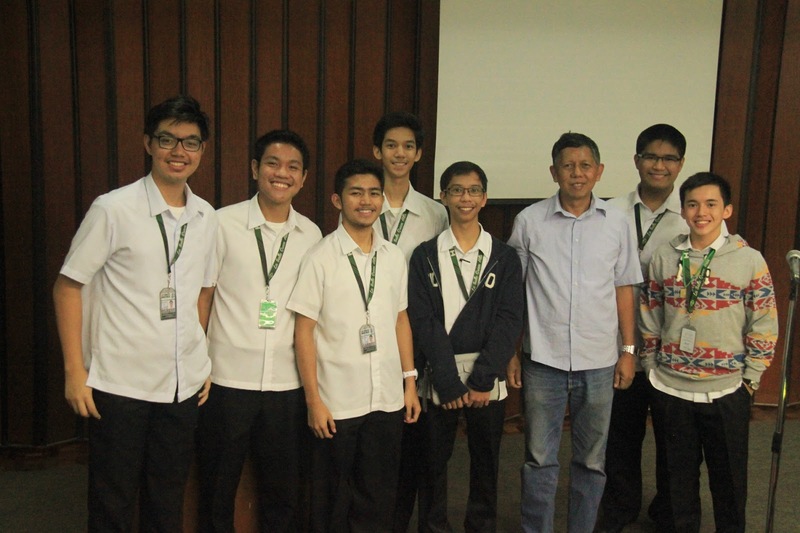 Only 10 of us were invited, nine came.Photo below, from left: Dr. Epictetus "Lingling" Patalinghug of the UP College of Business Administration and Foundation for Economic Freedom (FEF) fellow; Calixto "Toti" Chikiamco, President of the FEF; Dr. Dindo Manhit, President of SRI, Dr. CP David of UP NIGS and PBEST; me, and Ms. Nelia Halcon, Executive Director of the Chamber of Mines of the Philippines (COMP). The forum was moderated by Orly Oxales, Exec. Dir. of SRI while Dindo gave the opening message. 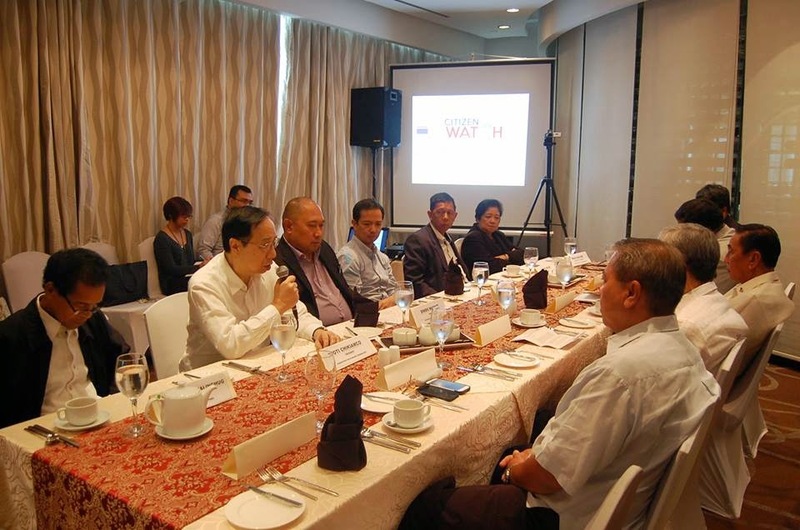 Orly asked us to give a 3-5 minutes insights on how to achieve further PH and ASEAN competitiveness. On the side, from left: Cong. 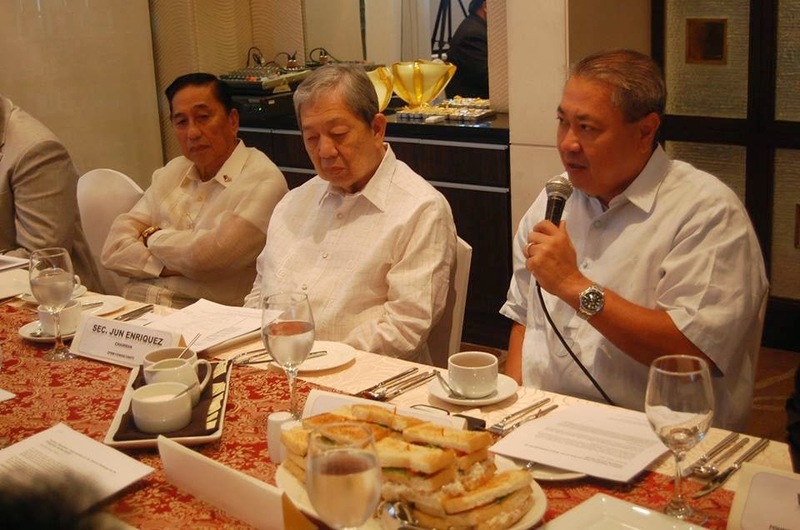 Rey Umali of Oriental Mindoro, and Chairman of the House Committee on Energy, Sergio Luis Ortiz, President of the Philippine Exports Confederation (PhilExport), Salvador "Jun" Enriquez, former DBM Secretary and now CPRM Consultant, and George Chua, President of the Federation of Philippine Industries (FPI). I prepared a paper, "Taxation, Regulation, Trade and Rule of Law: Reform Challenges for the Philippines and ASEAN Competitiveness", 12 pages including 9 tables and 2 charts. SRI printed and circulated it among the participants. Dindo liked it too, SRI will publish it in their website soon. Below, CP David speaking. He narrated that aside from being an Earth scientist, he is also helping his wife in their business, running a pre-school, and the hard life of being an entrepreneur being pressured to submit many requirements to get various permits from various government agencies, and the burden of paying various taxes and fees. George Chua discussed how the various bureaucracies, local and national, can be non-friendly to entrepreneurs. He cited one case, his importation. Because of the truck ban on certain hours by the Manila City government (Mayor is convicted ex-President Erap Estrada), there is huge congestion of cargos and ships at Manila international port. The ship that carried his imported goods arrived last June 5, but it was able to dock and unload the cargo only on June 12, and he was able to finally get the shipment last July 2. Productivity losses are huge. The number of documents required by the BIR has also multiplied in recent years. So it is not only the actual taxes and fees to pay that have increased, but also the cost of compliance. It was a great forum. Thanks again to Dindo and SRI for inviting me there. They will publish highlights of the discussion in their website soon. All photos above I got from PBEST facebook page. “We are dismayed that the MICC has moved forward with a proposed increased tax policy without taking into consideration comments and observations not only from the mining industry that will be directly affected by said policy but by authoritative third parties,” CoMP said. The MICC proposed a payment of 10% of gross revenue, or 55% of the Adjusted Net Mining Revenue, whichever may be higher. Perhaps the MICC, in particular the Department of Trade and Industry (DTI), environmental militants and LGUs want the big, legal mining firms to become illegitimate "small scale" miners, them who pay zero tax to the BIR, only small fees to LGUs, do not undertake any CSR or reforestation after mining. I heard that the MICC bills are DTI versions, Am curious, why did they stop at 79% effective tax rate, why not 89% or 99%? Kunin na lahat ng gobyerno? The MICC approved in May the imposition of either a 10 percent tax on gross revenues or a tax of 55 percent on adjusted net mining revenues (ANMR) plus a percentage of windfall profit, whichever would give higher revenues to the government. ANMR pertains to the difference between gross sales and direct cost (direct mining cost and administrative expenses). Contractors shall still be liable to pay real property tax, stock transaction tax, documentary stamp tax, withholding tax on passive income, as well as regulatory fees and charges. The Canadian business chamber is also urging the replacement of the MICC by a new Consultative and Advisory Council on Mining (CACM) which would have a wider stakeholder representation in government, private sector and business groups. “There are other countries with more reasonable tax structures and are equally [if not better] endowed than the Philippines,” (COMP) said. Since July 2012, only one or first mining exploration permit has been issued? See 1st mining permit issued, Manila Standard, July 01, 2014, Mining is really "evil." The production and manufacturing of cell phones, watches, laptops, tv, cars, buses, etc., all products of mining, should be limited to restrict the march of this "evil" industry. A friend from EITI commented that "the social cost of mining is different from mining in Canada, Peru or Australia. Mining tax which constitutes the bigger chunk of social benefit from mining should outweigh social cost." My friend saw Rio Tuba nickel mining that responsible mining -- zero mine tailings in rivers and sea; rehabilitation and reforestation of mined out areas, giving livelihood projects to nearby communities even if the people there are not employees, etc. -- is happening. Only large-scale corporate mining can do that. What reallly causes high "social cost of mining" is small-scale mining. Zero tax payment to BIR, zero reforestation and rehabilitation after deep and wide quarrying, zero education/ healthcare/ housing programs for employees, etc. So by pushing for heavy taxation of large-scale, legal mining, government and the militant NGOs are pushing some of these companies to sub-contract the work to "small-scale" while reporting small revenues that are subject to 79 percent tax rate, exclusive of the cost of mandatory CSR projects to communities. 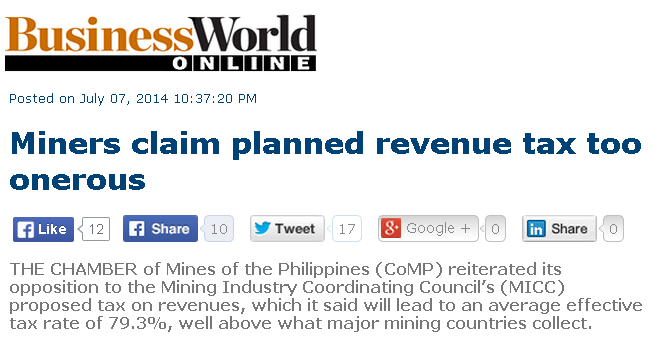 I think if government will further raise mining taxes, only the corrupt players will survive. The tax assessors and collectors will extort money while the players will pay and bribe them, in exchange for understatement of revenues and hence, the taxable income. The honest big players will slowly fade away. Reposting here some notes and quotes on the subject which I posted in the facebook group, Government and Taxes, Liberty and Responsibility last month. A good chart from Cato last May 3, 2014. Globalization eradicates poverty, posted by Daniel Castro. Actually, the term "globalization eradicates poverty" may be wrong. Poverty may never be eradicated as there are many factors that contribute to it, including personal irresponsibility and laziness. A better term would be "globalization reduces poverty" and inequality among countries. Free trade can lead to factor price equalization (FPE) and commodity price equalization (CPE) across countries over the long term. 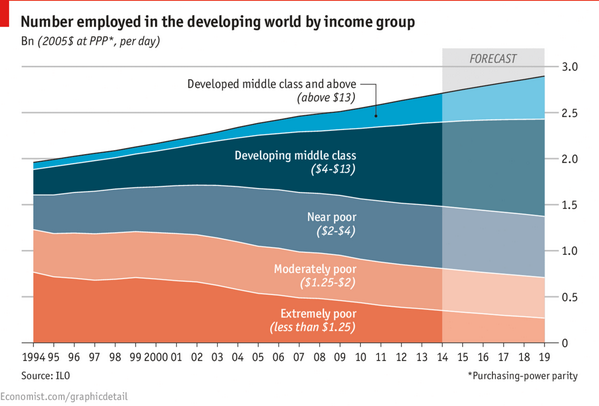 Many activists complaining of "widening inequality" will not be happy with this data from The Economist daily chart -- the number of "extremely poor" in developing countries is declining while the number of "developing middle class" and "developed middle class" is rising. Reading Thomas Piketty’s influential new book Capital in the Twenty-First Century, one might conclude that the world has not been this unequal since the days of robber barons and kings. 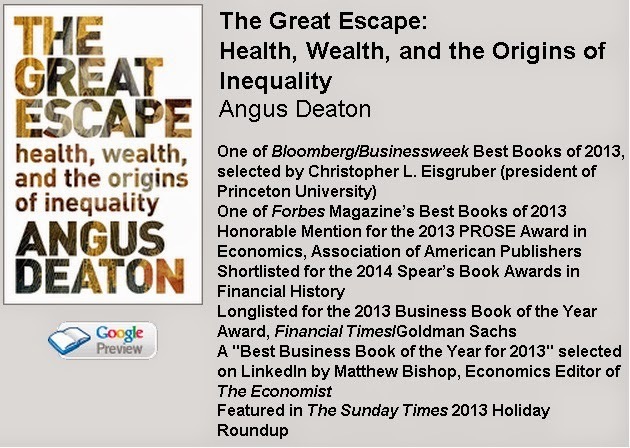 That is odd, because one might conclude from reading another excellent new book, Angus Deaton’s The Great Escape (which I recently reviewed), that the world is more equal than ever. ... over the last few decades, several billion people in the developing world, particularly in Asia, have escaped truly desperate levels of poverty. The same machine that has increased inequality in rich countries has leveled the playing field globally for billions.... when it comes to reducing global inequality, the capitalist system has had an impressive three decades. From Freedom Barometer June 12, 2014, written by Dr. Sethaput Narueput. One can even argue that globalization has reduced inequality. Most discussions of inequality focus on national inequality, which has increased. But global inequality, which looks at differences in income across people regardless of what country they are in, has dropped because many more Chinese and Indians now have higher incomes, in significant part due to globalization and freer markets. ... globalization is an inevitable phenomenon and a good one. It is the one that has helped mitigate the income inequality situation. Income inequality actually comes from not enough globalization and protectionism and monopoly. 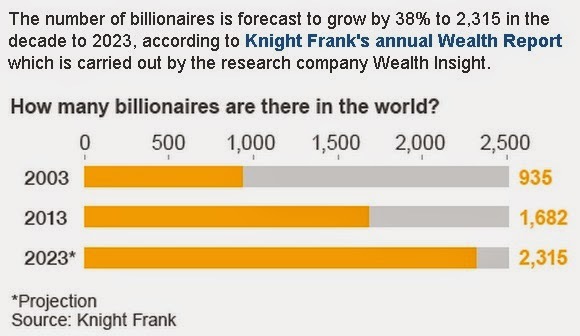 Thomas Piketty’s idea on global tax of wealth is plainly wrong. 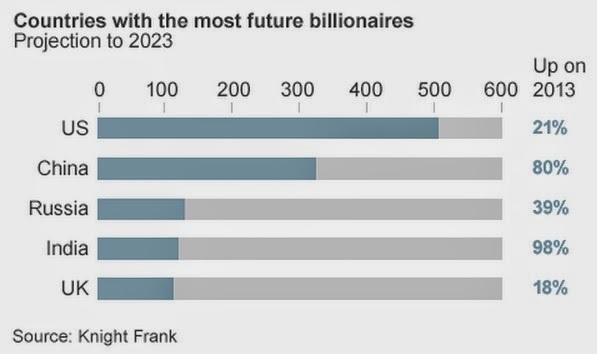 The extremely wealthy are growing in numbers and entire industries are being created to cater to their desires but where are the individuals who are amassing vast fortunes based and what do we know about them? Multi-billionaire Edward Zhu, who moved to China from the United States two decades ago, says talented people should start from nothing and that is what he wants for his children. 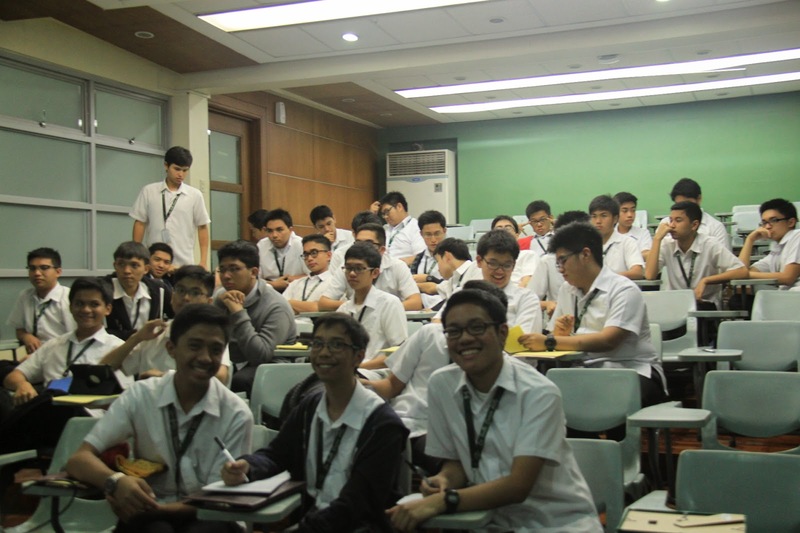 Meanwhile, here are some photos during my talk on "Globalization, Mobility and Inequality" at La Salle Green Hills (LSGH) 4th year high school/graduating students, Honors Class, last February 17, 2014. The officers of the Honors Class. 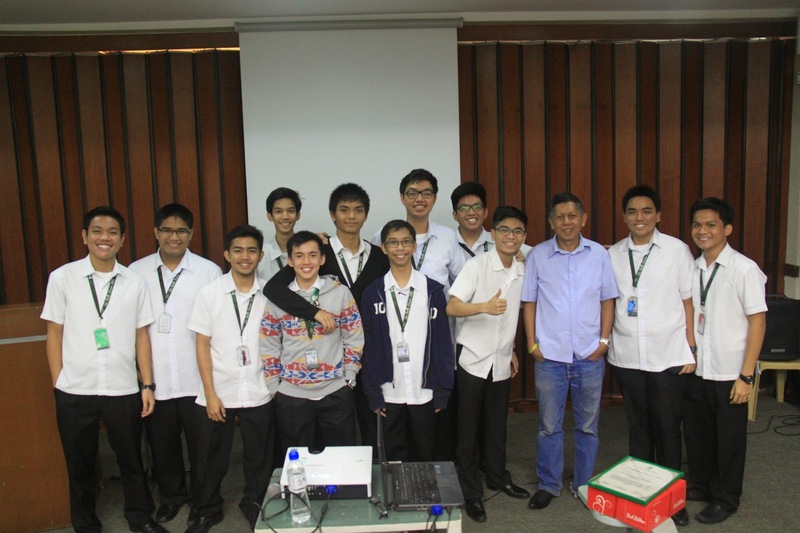 Mike Roa, the class President, right most. He's the son of a batchmate from UPSE 1984, Malou Roa. 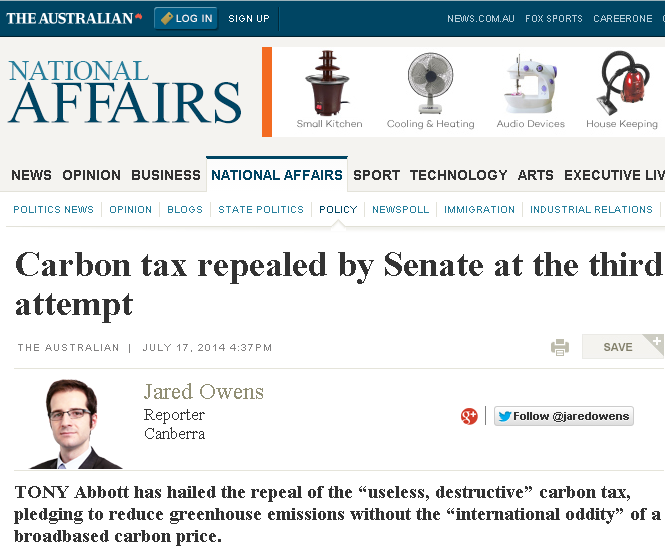 Today, Australia officially killed the onerous and climate alarmism law, carbon tax. I am posting below portions of selected news reports on the subject. The Prime Minister, while claiming victory after a five-year campaign against carbon pricing, also launched a new campaign against the Labor Party’s promise to take a replacement emissions trading scheme to the next election. Airline operators also said they had been hurt badly by the tax, at a time when intensifying competition in Australia's domestic travel market was already driving down ticket prices. Virgin Australia Holdings Ltd. VAH.AU 0.00% said it lost A$27 million in the six months through December 2013 due to the carbon tax, saying it couldn't pass costs on to passengers because of stiff market competition. It reported a first-half loss of A$83.7 million." Earlier, WUWT, June 10, 2014, noted the alliance between the two leaders of Australia and Canada. 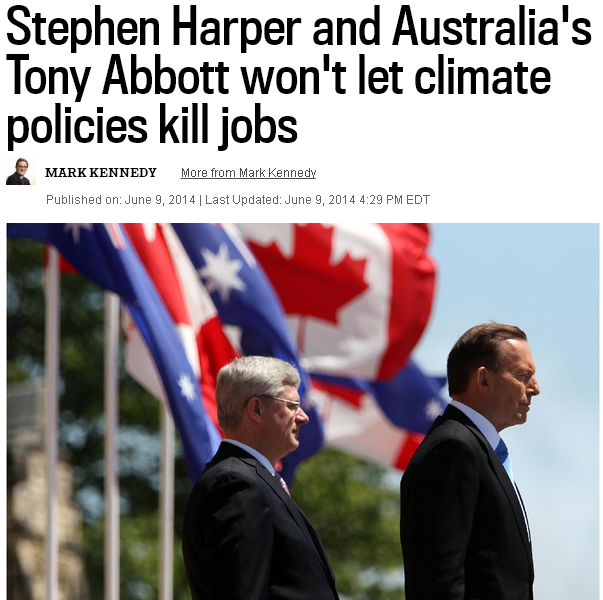 Abbott, whose Liberal party came to power last fall on a conservative platform, publicly praised Harper for being an “exemplar” of “centre-right leadership” in the world. Abbott’s government has come under criticism for its plan to cancel Australia’s carbon tax, while Harper has been criticized for failing to introduce regulations to reduce greenhouse gas emissions in Canada’s oil and gas sector. In a report by the Sydney Morning Herald, it said the alliance may be a "calculated attempt" to push back on what both Mr Abbott and Mr Harper sees as a "left-liberal agenda" to raise taxes and "unwise" plans to address the issue of global warming. 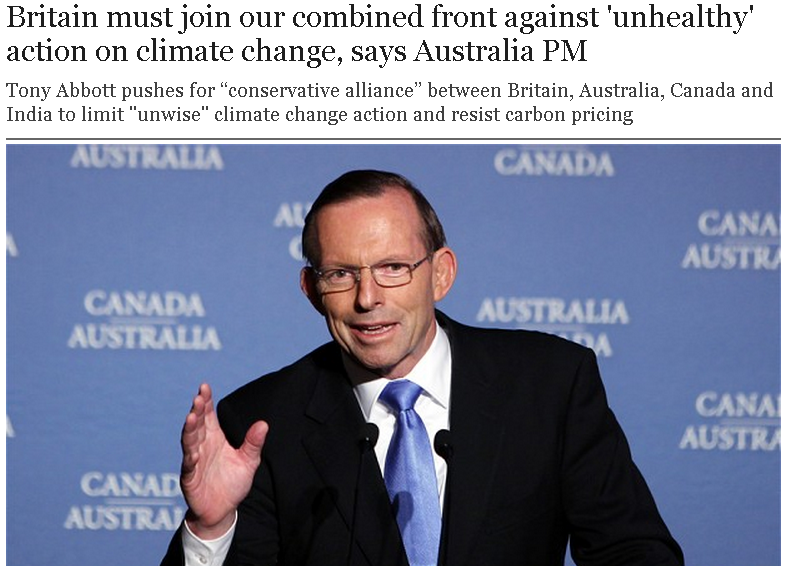 ""Like-minded” countries such as Britain, Canada and India should form a conservative alliance with Australia to limit action on climate change and to prevent the introduction of carbon pricing, the country's prime minister Tony Abbott has said. Seeking to counter Barack Obama’s efforts for international action to reduce carbon emissions, Mr Abbott has reportedly sought to create a “combined front” with fellow Commonwealth nations that have conservative governments." 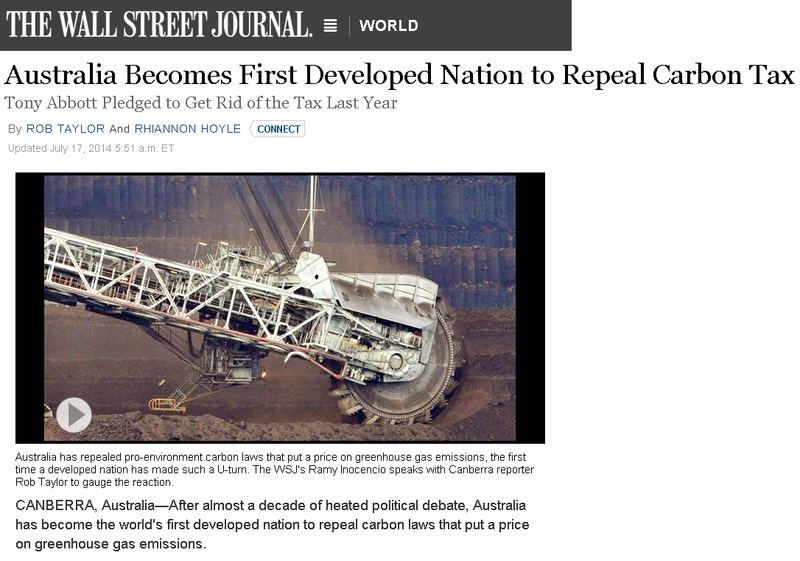 September last year, Tony Abbott also abolished the Ministry of Climate Change, helped shrink the size of Australian government. BEIJING, Sept 16 (Reuters Point Carbon) - The new Australian Cabinet will be the first in six years to not have a ministerial role for climate change issues, merging instead global warming with the wider environment portfolio. 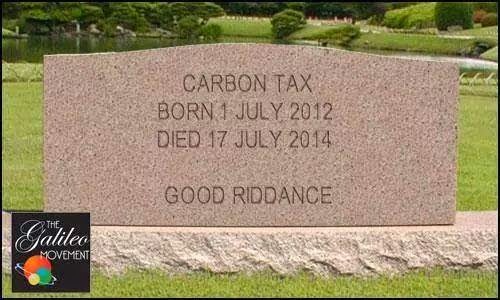 So, RIP, carbon tax, at least in Australia. I hope that other developed countries will realize the folly of making things, from electricity to manufacturing to mining to flying and tourism, become more expensive than what they should be. People want affordable products and services so they can live a more prosperous, more comfortable life. It is the reward for their hard labor and work efficiency. Yesterday, I was upset that the Philippine Atmospheric Geophysical and Astronomical Services Administration (PAGASA) declared public storm warning signal (PSWS) #1 over Metro Manila at 11:45am, when it was sunny, thin clouds above. So pre-school afternoon classes have been cancelled. My younger daughter who was excited to go to her 12:30 – 3:30pm class was sad when I told her that classes have been cancelled. The range of PAGASA warning was far out, signal #1 from Marinduque & Burias Islands south of M.Manila up to Tarlac and Pangasinan in the north. 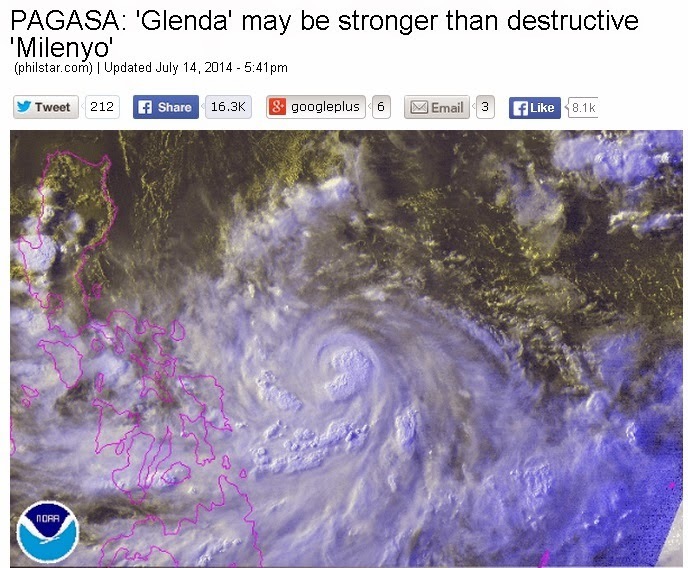 Tropical storm “Rammasun” (local name “Glenda”) was still several hundreds of kilometres away from any Philippine island when the storm signal was declared. I could understand putting Marinduque, Batangas, Quezon under signal #1 at 11:45am, but not Metro Manila. There was no strong rain the whole day yesterday until evening, until this morning. Below, PAGASA graphics as of 11 am today. 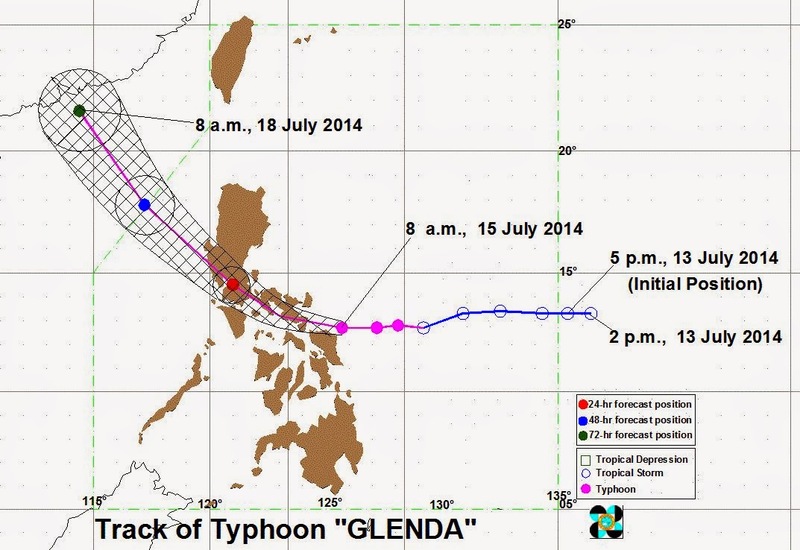 "Forecast Positions: Tropical Storm“GLENDA” is expected to be in the vicinity of Virac Catanduanes by tomorrow morning and at 240 km Northwest of Dagupan City by Wednesday morning." So a landfall about 20 hours away, in Catanduanes island far away from Metro Manila, was far out to declare signal #1. PAGASA was being paranoid. "Expect thunderstorm over Nueva Ecija, Metro Manila and other areas of Rizal in the next 2 hours." By 5 pm, there was no thunderstorm in M.Manila. So even a forecast for the next two hours, PAGASA can be imprecised. One reason why people and meteorological agencies like PAGASA and others under the UN World Meteorological Organization (WMO) should stop claiming with certainty that global temperature will rise by 1 or 2 or even 4 C some 100 years from now. Some friends suggested that it is a “no win situation” for PAGASA, especially if they do not declare a storm signal and it pours hard, they will be blamed by the public. 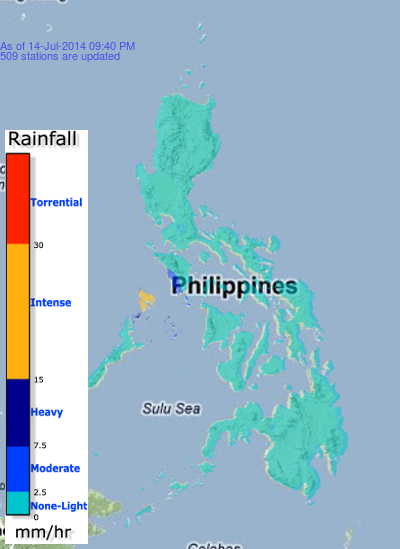 Rainfall amount as of 9:40pm last night. Zero rainfall nationwide, 10 hours after the "signal #1" warning. My concern is the prolonged class cancellations. All classes from pre-school to high school have been suspended today in Metro Manila and surrounding provinces; and there was class cancellation yesterday afternoon. And possible class cancellations again tomorrow as the storm exits the country. Up to 2 ½ days cancellation. Paranoia can cause damages like loss of productivity. Parents pay for school fees and schools don't hold classes because of some paranoid weather announcement. Problem here, no one can hold PAGASA liable. It has no contract with anyone of us, so it breaks not a single contract, so no one can sue it or penalize it, like cut its annual funding. We have gotten used to government inefficiencies that one inefficiency after another becomes tolerable and even defensible. The usual solution is to give more tax money to an inefficient agency. "Ayy inefficient sila, kulang kasi sa pondo, dagdagan natin." Below, a news headline from Philippine Star yesterday. If one has a big event, say a musical/rock concert, and PAGASA says there will be storm signal #2 or #3 on the day of the event, the organizer cancels the event two or three days ahead, and the storm was not even of signal #1 strength, who can the organizer blame and possibly ask for compensation for the damage? Not PAGASA, it has no contract anyone in the country except Congress. Sorry na lang tayo pag palpak forecasting nila. Most likely they will get additional funding from Congress next year. A monopoly is rewarded, not penalized, for its inefficiency. If it is a private forecasting company, it will go bankrupt if it continues to provide false forecasts. Again, weather and climate are highly uncertain and forecasts are highly unreliable the longer the projected period. When some government agencies predict a global warming of 2 C or 3 or 4 C100 years from now, they can be practicing voodoo science to produce voodoo scare in the hearts and minds of the public. And the public can be easily hoodwinked to accept various environmental regulations, energy taxation and cronyism, huge climate loans, climate bureaucracies and frequent climate junkets. 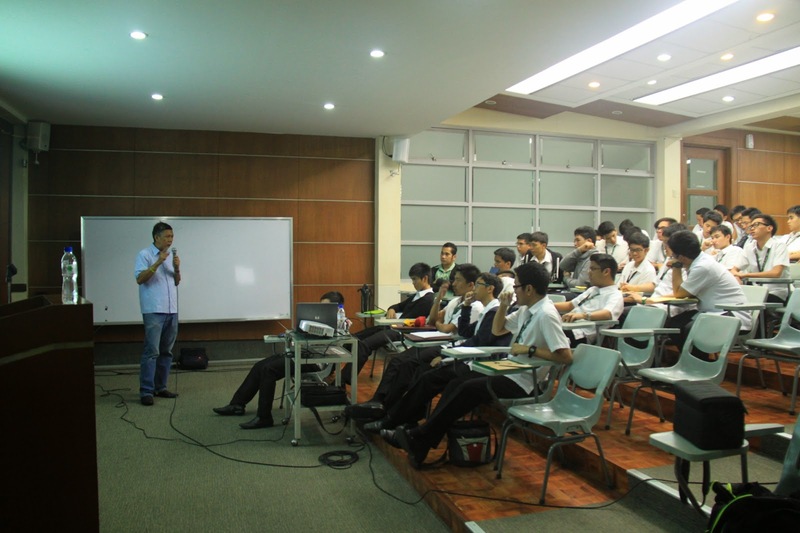 PAGASA Bureaucracy 2: Deregulate Weather Forecasting, Privatize PAGASA, December 20, 2011. Related to the never-say-die hypothesis that with more globalization and global capitalism, "the poor are getting poorer". This table says that hypothesis is, once again, wrong. Even the poor in poor countries like Bangladesh, Mexico, Nigeria, Philippines, India, Indonesia, China, etc. can afford to buy mobile phones. Many of them are even buying 3G and 4G phones. And here is the overall global picture. 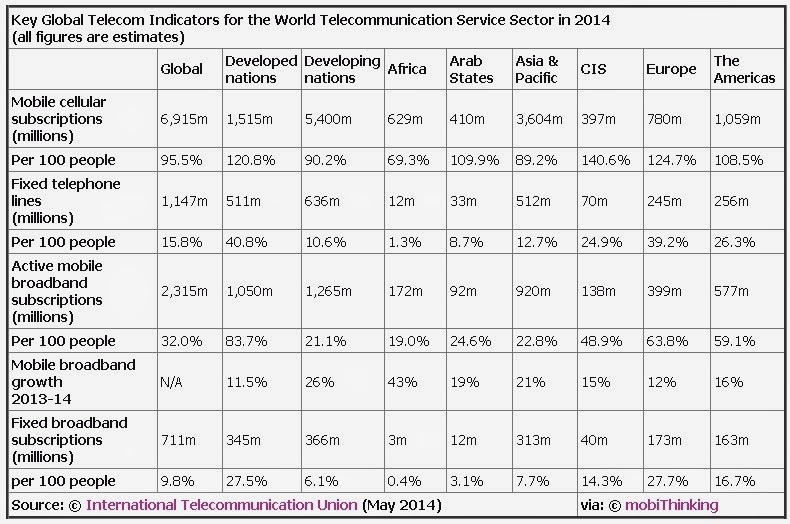 Some 90 percent or 5.4 billion people in the developing world, have mobile phone subscriptions. Until about two to three decades ago, many middle class could not even afford to buy a mobile phone. Now even taxi drivers, bus drivers, ambulant vendors, have smart phones. There. The anti-capitalism, anti-globalization logic is proven to be wrong again. Global capitalism works for the poor. 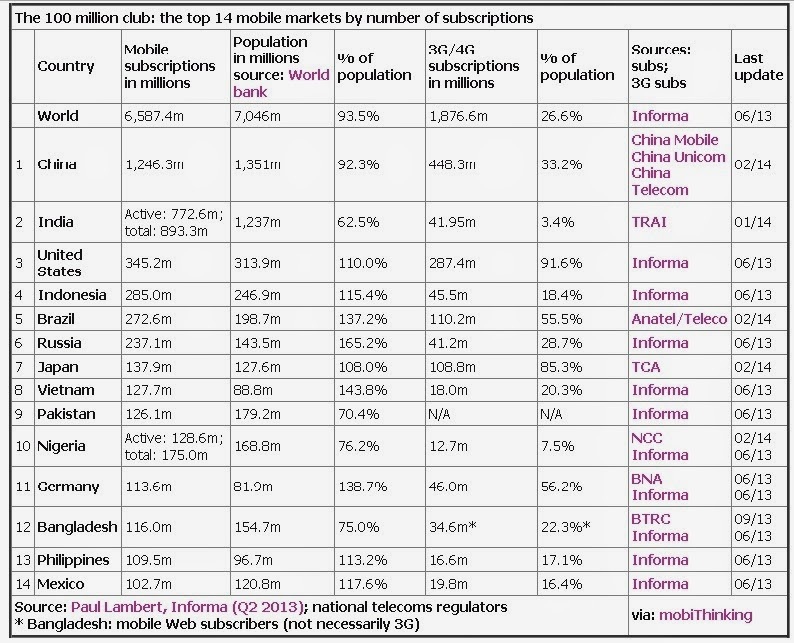 The fierce competition among mobile phone manufacturers, among global telecom companies and related sectors or industries have forced the various players to keep churning out more products and models that cater to all segments of consumers including the poor, both in the developed and developing world. One can have a brand new smart phone now for only $50, just get the lesser known brands like Cherry or MyPhone. On inequality, the poor before ride cows, carabaos, horses or bicycles while the rich ride a Toyota corolla, etc. Now the poor ride motorcycles while the rich ride SUVs, if not a Benz, BMW, Audi or Ferrari. Is this bad for the poor? Some may say Yes but most poor people would say No. Some people suggest a "smartphone vs food or education" in their household budget. I think it is not a "vs" but rather "and". Let me cite the example of our part time caretaker in our farm in Bugallon, Pangasinan. He is a tricycle driver, rice farmer, part time worker in the farm, helps his wife manage a small sari sari store, while taking care of their 2 young kids. Some of his friends or neighbors will text him and ask him to drive them to Lingayen or Dagupan or San Carlos, etc. This raises his income, thanks to texting and his mobile phone. Then he can ask by text how much are prices of dried fish in Labrador, about 20 kms away, if the price is low, he would drive there and buy various dried fishes and retail them in the barrio and that again raises his income. That is why access to telecom and mobile phones is largely an income-enhancing experience and investment of the poor. It is a more effective poverty-fighting event than some government welfare and dole out programs. A German friend cited the example of watching tv in the UK after tv was introduced more than a century ago. One might say watching a comedy on tv is a waste of time. but perhaps the person is sitting on a sofa watching a comedy together with wife and not going to a pub instead. He is saving money, he can spend it on other things. In addition. after tv was introduced, about two-thirds of Britain's pubs had to close, there was more in the average household kitty (usually administered by women) and drink-related violence (stabbings, etc) decreased. Less government interventionism and regulation, more competition among players and capitalists, they are led by an "invisible hand" to serve the interests of the poor which may not be their original intention. This 2013 data does not include foreign direct investment (FDI) outflows, only inflows and thus, the net inflow is not shown. Still a useful data. 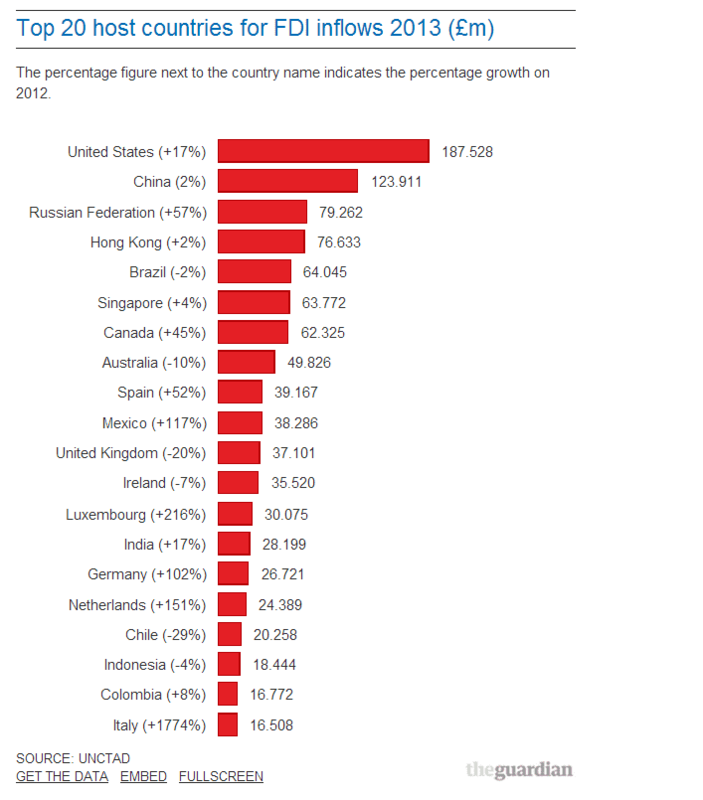 For European economies in this list, including the fiscally-unstable ones like Spain and Italy -- and note, France is not in the top 20 -- most of those FDI inflows I think are from EU members also. I am interested to see the net or balance (inflows minus outflows). In the ASEAN for instance, Malaysia has high FDI inflows but FDI outflows are also high, so net inflow is negative for 2012 and 2013. I don't remember where I saw the data. More taxes and higher tax rates do not necessarily lead to higher tax revenue collection and economic success. Know the concept of Laffer curve. At present, Hong Kong applies low and simple tax regime. Despite levying 15% salaries tax (the equivalent of our income tax) and property tax, HK government does not impose sales tax or VAT, withholding tax, tax on dividends and estate tax." About the US' high FDIs, it has a perennial trade deficit, around $1.5 billion a day on average. But it is also gaining with huge FDI inflows. High negative current account is somehow offset by positive capital account, so overall balance of payment (BOP) is not so damaging. Have to check the numbers. China should be bulging with high trade surplus but it also has high FDI outflows, buying many US companies via FDIs or portfolio investments, in US stock markets. HK government's main revenue I think, is not from taxes, but in selling land. It is the biggest land owner, the biggest land developer. Besides, if you have a dynamic economy, lots of private investments and private enterprises, many people have jobs in the private sector, government does not need to create too many welfare and subsidy programs, nor government should hire too many people. Some local companies have grown increasingly vocal in recent weeks in opposing pro-democracy activists. The Occupy Central movement—a respectable group, unlike those who camped out in Lower Manhattan a few years ago—is promising to bring gridlock to Hong Kong's central business district if Beijing doesn't follow through on its pledge to allow genuine democracy in the territory by 2017. Many businesses are concerned about the risks and costs of business disruption if parts of Hong Kong come to a standstill. The Hong Kong offices of the Big Four accounting firms late last month took out an ad in several local newspapers warning that the protests would "shake" international confidence in the territory and could send foreign investors fleeing…. The companies err badly on the merits. If it's allowed to continue, the territory's slide into Beijing-lite authoritarianism, with the loss of rule-of-law and concomitant rising public discontent, will be far worse for business than the temporary disruptions of a public protest. 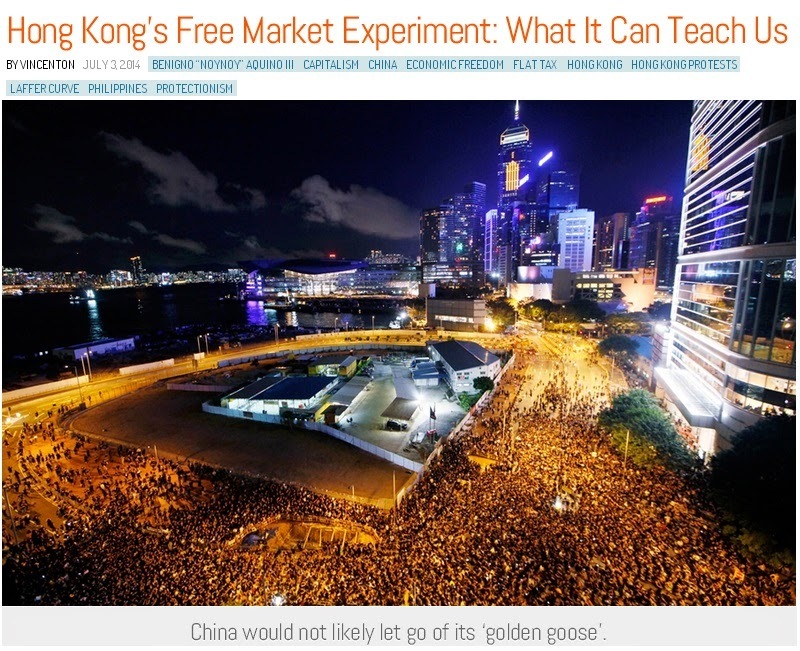 But in most political systems, including Hong Kong's (for now anyway), being wrong is not a crime…. In response to the Big Four newspaper ad, an anonymous group of the firms' employees bought their own ad supporting Occupy Central. To the extent that the universal suffrage those employees support undermines the influence of functional constituencies, the accountants are arguing against their electoral self-interest. But they seem to realize that real democracy is in the political and economic best interests of all Hong Kongers, and Hong Kong's companies. It's a more enlightened view than that of their employers. I am against street occupations because they are another form or type of coercion and massive prohibition. People's freedom to walk, pass by, do business in the affected areas are prevented or restricted. But I am also against permanent BIG government coercion and dictatorship, like the China communist government dictatorship. I hope the Occupy movement in HK will minimize business disruption in the business district, while sustaining the campaign to free HK from the clutches of Beijing's long distance communist intervention. 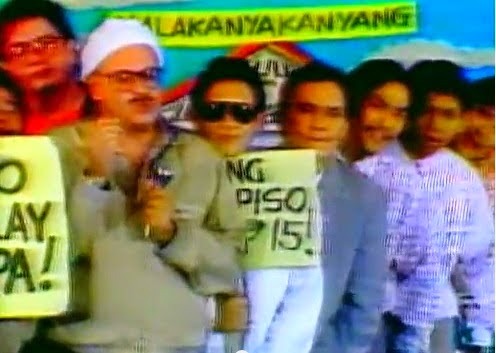 With endless corruption and other political scandals on-going in the Philippines today, the public would have great fun if the political satire program on tv more than two decades ago, Sic O'Clock News, is still around. The program ran from around early 1987 to late 1990. I joined its last 10 or 12 months shows, late 1989 to late 1990, as among the minor comedians :-). In this photo, I was the one standing. 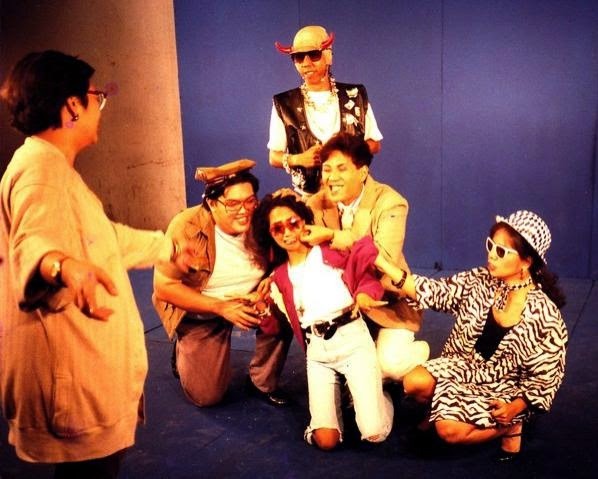 Others from left): Direk Marilou in action (facing us), Wilson Go, Dina Padilla, Khryss Adalia (RIP) and Celeste Bueno. 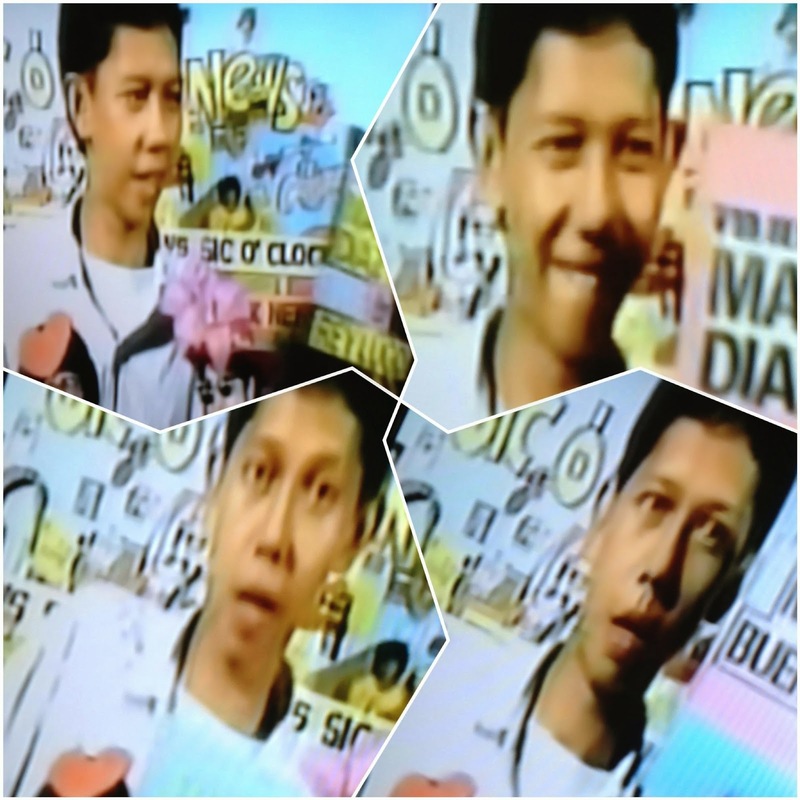 See Weekend fun 19: Sic o Clock News. From left: Errol Dionisio (partly hidden, RIP), Wilson Go, Jimmy Fabregas, Ching Arellano (RIP), Manny Castaneda, Noni Buencamino, me, and Khyss (partly hidden). See Weekend Fun 55: Sic O'Clock News, Again. Yesterday, a friend, Rommel Banlaoi, posted this in my fb wall. I don't know where he got it, but thanks a lot, Rommel. 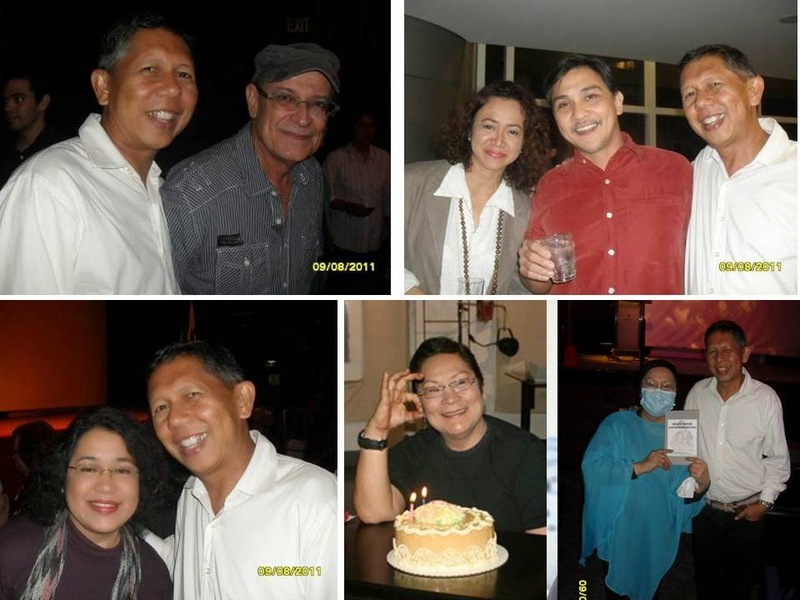 Some photos in September 2011, at an event for Direk Marilou at the Yuchengco Museum, RCBC Plaza, Makati City. Direk was undergoing chemo treatment then. From top left clockwise: with Jimmy Fabregas, Noni Buencamino and his wife Sharmaine, with Direk Marilou, Direk in earlier years, and with Ces Quesada. See Transitions 4: Direk Marilou Diaz-Abaya. Is it possible to bring back Sic and its key actors and actresses? No. Many have migrated to the after life already. I miss those who have departed -- Direk Marilou, main scriptwriter Mads Lacuesta, actors Khryss, Ching and Errol, our producer then Gus, and so on. The living ones, we still "see" each other in facebook. We have a close fb page, "Sic O'Clockers". Fun days then. We were young, wild and free. Now, we are old, wild and free.